Most of us are now familiar with the Apprenticeship Levy, announced last year in the July budget. 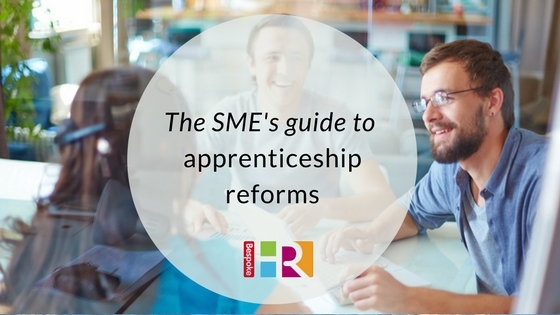 However, what you may not know is that it was introduced alongside a swathe of other reforms to the way apprenticeships are run – some of which could benefit your business. “This is the most fundamental reform of the vocational training industry in the UK since 1992, and will affect all employers – even if indirectly” explains Andrew Hooper of apprenticeship provider, Boom Training. The good news for SMEs is that they are not required to pay the levy – only those with an annual wage bill of more than £3m per annum are eligible. In real terms, this is less than 2% of employers in the UK. However, there are two changes which all employers should be aware of. Funding mechanism: all businesses employing apprenticeships will now have their own funding account which give them control and allows them to choose where to spend their money. New curriculum: the old framework, which used to include up to five qualifications, is now being replaced with much simpler standards. These will be outlined in a simple document which resembles a job description. The major point is that they will now be more specific and allow apprentices to progress to higher qualifications, so employers can use more advanced training options. “Another important feature that many employers we work with don’t appreciate is that the scheme (and the funding that comes with it) can be used to train existing staff of any age, as well as young, new employees” adds Hooper. Businesses with fewer 50 employees: if hiring an apprentice who is 16 – 18 years old, the employer fee is waived and the government funds the programme entirely. Hiring 16 – 18 year olds: as an incentive, the government is also offering a £1,000 grant to any employer who takes on a 16 – 18 year old as an apprentice. This can be offset against their fee (if relevant) or their salary. Should you employ an apprentice? Apprenticeships are currently available in 1,500 job roles, covering more than 170 industries. According to the National Apprenticeship Service, apprenticeships boost productivity to businesses on average by £214 per week. They also enable small businesses an opportunity to build a pool of high quality future recruits for their sector, with 75% of employers reporting that apprenticeships have improved the quality of their product and service. A genuine role (for at least 30 hours per week) which will make a real contribution to your business – along with a detailed job description. A line manager or mentor who will be able to provide the additional support needed for an employee starting their very first role. A training provider you are happy to work with. In theory, all providers are quality assured because they are Ofsted inspected and audited by the government. However, it is worth getting a recommendation or vetting a few before signing up. If you hire an apprentice, they will need to be released from duties to focus on coursework. The amount of time required will vary but for most office-based positions you should allow at least half a day per week. This must be during their paid / contracted time, not outside their working hours.